In a speech I gave at The Empire Club of Toronto , I referred to gold as the “anti-currency.” Gold is not and never has been a currency. Gold is something entirely different and far more valuable. It is money. Most investors confuse money and currency, but they are not the same thing. Money is defined as a medium of exchange, a unit of account and a store of value. For centuries, the term “money” referred to coins made of rare metals (gold and silver) with intrinsic value, and to notes backed by precious metals. Currency, while it is a medium of exchange, is not a store of value. It derives its value only by arbitrary fiat government decree, hence the term “fiat currency.” Paper banknotes represent money but they are not money. They are simply promissory notes, whose long-term “value,” or purchasing power, depends entirely on the fiscal and monetary discipline of the government that issued them. Therein lies the problem. In an era of massive fiat currency expansion by profligate governments across the globe, today’s currencies are depreciating in value faster than yesterday’s news. Fortunately for precious metals investors, gold, silver and platinum have all risen in value, and will continue to do so against all currencies because they have resumed their historical role as stores of value: money. When the price of gold moves, gold’s price isn’t moving; rather it is the value of the currencies in which it’s priced that is changing. Currency debasement isn’t a recent phenomenon. For decades, governments around the world, through their central banks, have been creating money out of thin air to cover their mounting debt and excessive spending. Investors have for the most part accepted this subtle form of taxation, because it seemed to have little personal impact. But appearances are deceiving. Investors are discovering that the value of their dollar-denominated assets has actually declined a staggering 82 percent since 1971 (not coincidentally, the year the US cut its link to the gold standard). Figure 1 tells the story. Every day, the media (via currency traders) informs Canadian investors about the latest price of the Canadian dollar in US dollar terms, while US investors compare the US dollar to a basket of the world’s major currencies. But this information gives investors surprisingly little insight into the true value of their portfolios. If we started measuring the world’s currencies against money (i.e. 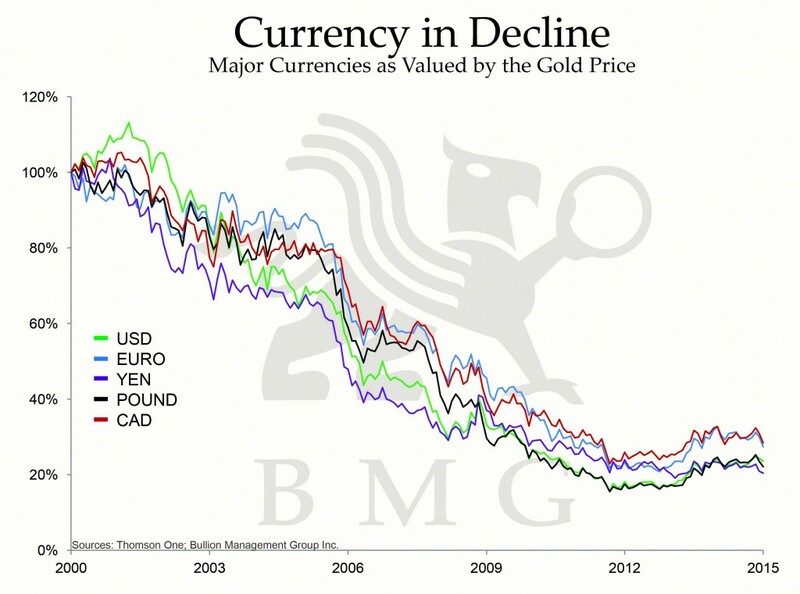 gold), investors would be horrified at the stark decline in the value of all currencies. Most investors’ portfolios are heavily weighted towards currency-denominated financial assets (stocks and bonds), but few realize that the true value or purchasing power of their portfolios is declining every single year because of currency depreciation. Since 1913 (the year the US Federal Reserve was established), the US dollar has lost over 95 percent of its value. 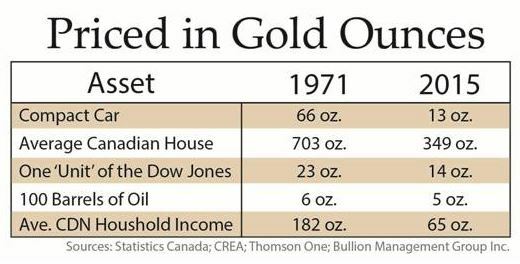 The US and Canadian dollars have lost 82 percent of their value since 1971, as noted earlier. 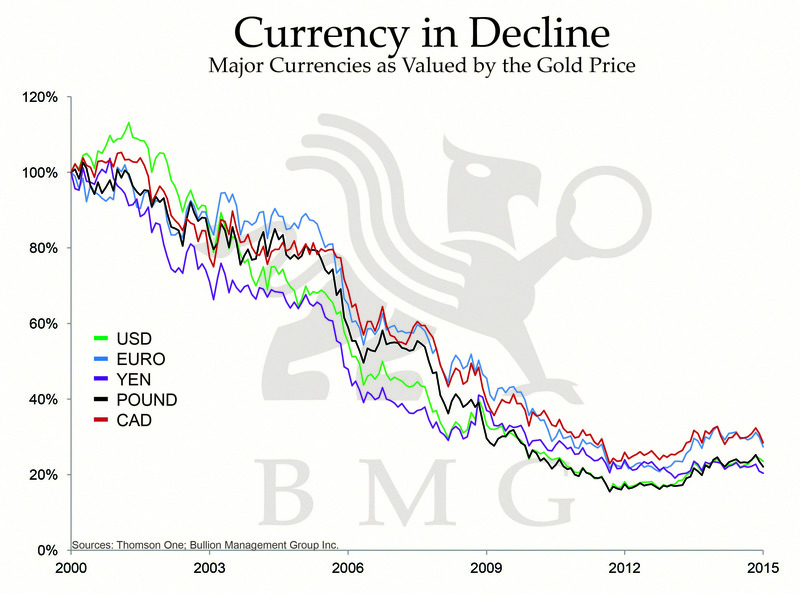 In the past ten years alone, the US dollar, the Canadian dollar, the UK pound and the euro have all fallen 70 percent in value if measured in real (currency-debased) terms. In other words, when they are priced in terms of gold (Figure 2). Not too long ago, all the world’s major currencies were backed by gold because it was a universally recognized store of value. The gold standard imposed fiscal and monetary discipline, since each country had to hold enough gold to equal the amount of money in circulation. But not any longer. 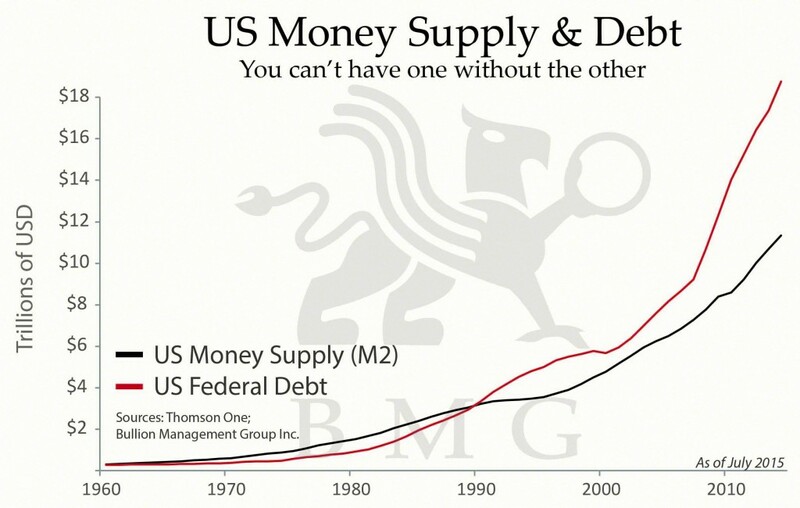 Government spending around the world is exploding, and (fiat currency) money supply, along with government debt in the world’s major economies, is exploding along with it. But nowhere in the world has spending become more out of control than the US (Figure 3), where the monetary response to the 2008 financial crisis is creating yet another bubble, and this time it will be the bubble to end all bubbles. In the process of saving a few ‘too big to fail’ corporations and their bond holders, policymakers are greatly increasing the risk of sovereign defaults. The risk of massive and widespread sovereign debt default has never been higher. “Official” US government debt has soared to over 100 percent of GDP over the past several years. Japan, the third-largest economy in the world, carries a debt of 227 percent of GDP, and has been in a borderline depression for 30 years, cyclical rallies aside. The UK deficit is one of the highest in the developed world at 5 percent, despite recent spending cuts and increased tax revenues. Greece, Italy, Portugal, Singapore and Belgium have joined the US and Japan with debt- to-GDP ratios above 100 percent. Greece is in the headlines on a daily basis, teetering on the edge of sovereign debt default. And then there is Iceland, whose debt had exploded to seven times GDP before the global meltdown. The country’s banking system collapsed, its currency was deeply devalued, its real estate market imploded and the country fell into a very serious recession. Only by imposing (then later removing) capital controls and refusing to bail out the banks was Iceland able to begin economic recovery. As the world’s reserve currency, the US dollar is a proxy for the rest of the world’s currencies. Massive debt is a direct reflection of America’s deepening financial troubles, exacerbated by a ravaged banking system that, between 2008 and today, has seen over five hundred banks become insolvent. In 2014, the US incurred a budget deficit of $483.35 billion, and its debt rose to over $18 trillion. By the end of 2015, America’s total government debt is forecast to be $18.628 trillion. In an attempt to reflate the bubble-driven economy post 2008, President Barack Obama, then Fed Chairman Ben Bernanke and then Treasury Secretary Tim Geithner decided to add to the financial house of cards. Instead of raising taxes or cutting expenditures, they decided to borrow their way out of the problem and have the Fed create money out of thin air, creating other bubbles that have yet to burst. These bubbles will make the others pale by comparison, and will help destroy the US dollar. The dollar may be the world’s reserve currency, but China and other countries are not only questioning its status, but also actively campaigning for greater use of alternative currencies. Where are most investors putting their cash? It should no longer be in stocks. Key stock indices like the Dow Jones Industrial Average have been flat to negative in nominal terms since the end of the last century. 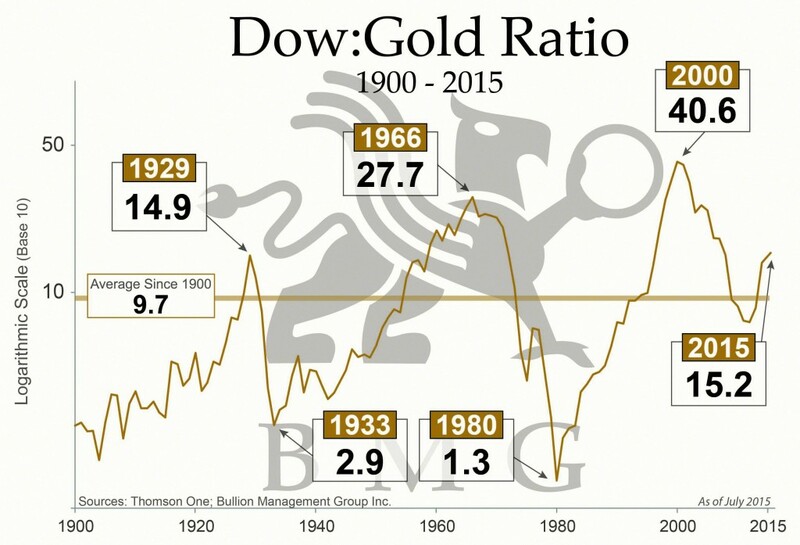 But if the Dow is priced in gold (in other words, money) as opposed to depreciating dollars (in other words, fiat currency), its decline is far more dramatic. 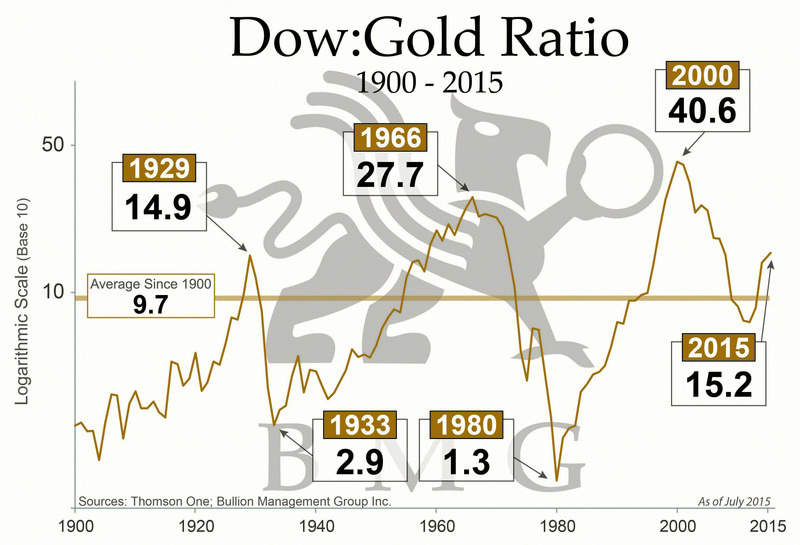 As Figure 4 shows, the Dow:Gold Ratio, while in the midst of an arguably mandatory healthy cyclical reversal within a secular bull market, is a continuing indicator to move from equities to bullion. Global creditors who currently hold trillions of dollars’ worth of dollar-denominated financial assets are dumping them to preserve their wealth. 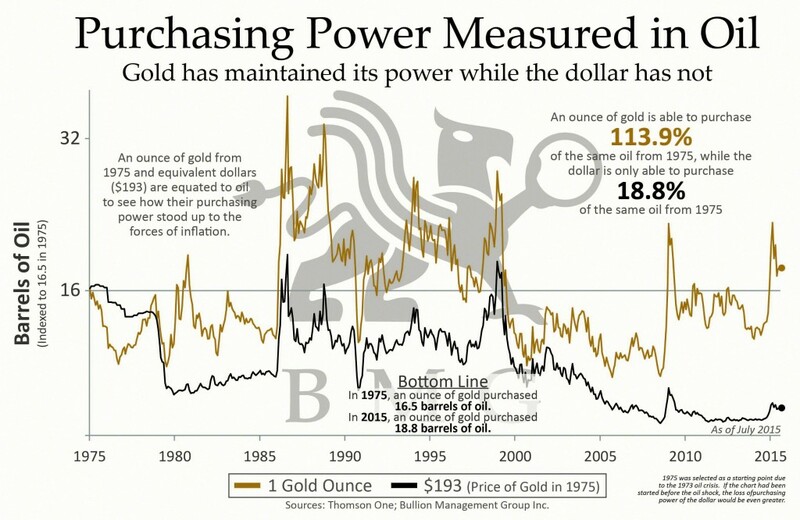 That is why gold bullion, along with its precious metals cousins, silver and platinum bullion, have been consistently holding their value against financial assets (Figure 5). Since 2010, central banks have been net buyers of gold. Central banks bought 477.2 tonnes of gold in 2014, the second largest increase in 50 years. Russia bought 30 tonnes of gold bullion in April 2015, adding to their 9-month gold-buying spree of 2014. China has steadily (and surreptitiously) increased its gold bullion reserves from 2009’s official figure of 1,054 tonnes to a speculated figure of anywhere between 3,000 and 8,000 tonnes today. The exact amount is yet to be disclosed, but China’s gold holdings will have an impact on the IMF’s consideration of adding the renminbi to the current SDR basket of currencies, thus increasing the likelihood that the US dollar will eventually be unseated as the world’s reserve currency. China’s One Belt, One Road initiative is yet another indication that the US dollar’s tenure as the world’s reserve currency is likely coming to an end. Ever-increasing spending and trade along the goldmine-rich route, and the ¥100 billion (US$16.1-billion) gold fund led by the Shanghai Gold Exchange, “will facilitate gold purchases for the central banks of member states to increase their holdings of the precious metal,” reported Xinhua. China’s central bank will be diversifying into gold for many years to come, and Russia is getting in on the game. China has also agreed with Russia to unify the new Silk Road high-speed rail project with Russia and Russia’s Eurasian Economic Union. At the same time Beijing has announced it is creating a huge $16 billion fund to develop gold mines along the rail route linking Russia and China and Central Asia. That suggests plans to greatly build up gold as central bank reserve share. 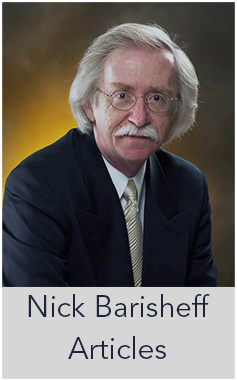 The world’s central banks know that gold is primarily a monetary asset, not a commodity. That’s why a growing number of them are quietly diversifying out of US dollars and adding to their gold reserves. Individual investors are not so farsighted – yet. Because most of them have only experienced one kind of market – a long bull market in stocks and an even longer 35-year bull market in bonds – many still think gold is just a commodity like copper, zinc or pork bellies. But gold is far more than that. It has a 5,000-year history as money. For much of that time, it was the universal medium of exchange because of its divisibility, portability, rarity, beauty, malleability and indestructibility. Despite today’s negative sentiment, gold is not a barbarous relic, nor is it a speculation trade. Gold is money. 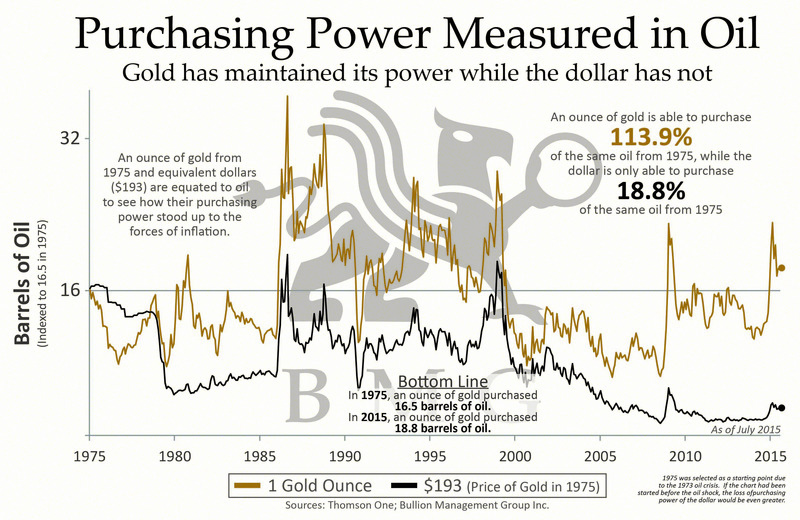 Gold retains its purchasing power year after year, as Figure 5 shows. Forty years ago it took 66 ounces of gold to buy a compact car. Today it takes only 14 ounces. If you had put your money in gold instead of dollars, the same car would actually be 79 percent cheaper, because gold keeps its value. Houses, stocks and virtually every other asset on earth would also be cheaper if bought with physical gold. If you are already a bullion investor, now is the time to add to your portfolio. 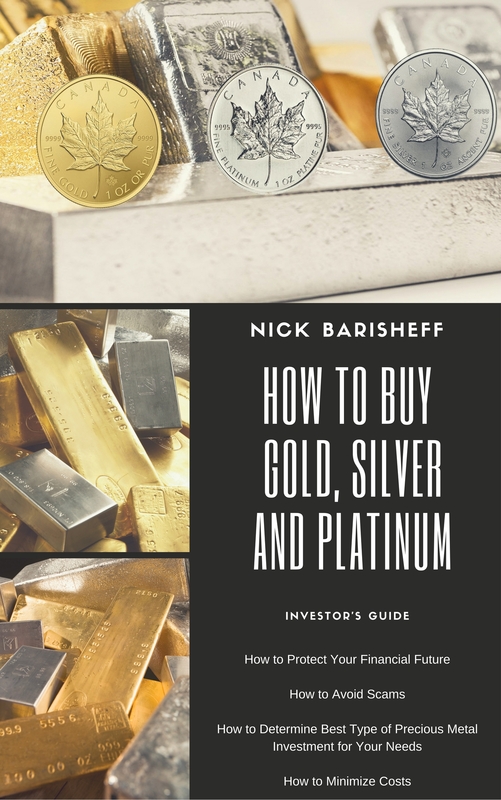 If you are new to investing in bullion, now is the time to start dollar-cost-averaging into bullion. I encourage investors to learn as much as they can about bullion and about the markets in general. A good place to begin is by subscribing to our weekly e-Newsletter, the BullionBuzz. 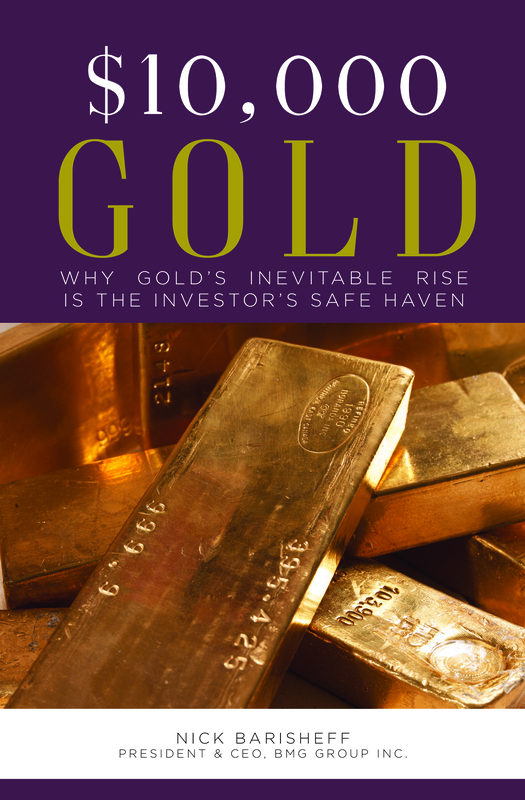 It offers a comprehensive look at the economy, money, markets and bullion investing, and provides a variety of thought-provoking articles written by experts in the field of gold, precious metals and the economy. Visit www.bmgbullion.com to subscribe. Gold is money because it cannot be created out of thin air by government decree. Unlike bonds, gold does not represent someone else’s liability and, unlike stocks, gold does not rely on someone else’s promise of performance. Gold is money because, unlike currencies, impatient monetary policymakers cannot simply print more. Currency-denominated financial assets are a disaster waiting to happen. The current economic rebound is a mirage, being entirely dependent on something artificial and unsustainable: massive government spending. A new crisis is building out of unprecedented fiscal and monetary mismanagement. Fortunately, smart investors can protect their wealth from the coming storm. The true level of risk has not been priced into the markets. The time to shelter your wealth from the storm is now. And there is no safer investment on earth than bullion, because bullion is, and always will be, money.